“This training gave me the opportunity to reflect on and evaluate the past three months of my EVS project and to plan the next ones. This mid-term training was also the occasion to meet other EVS volunteers in Russia and share experience and good practices. During the first phase of the training we got information about the projects and results of the participants. We were 6 volunteers taking part in it. Most volunteers in Russia this year are active with youth, children with disabilities, elderly or help in a kindergarten. On the second day, we talked about the YouthPass certificate, which constitutes the main instrument of the Erasmus+ programme to summarise the skills and attitudes the volunteer can acquire during his/her project. We considered the 8 key-competences in the light of which we can analyse our progress. We presented in pairs 1-2 of these competences in the form of a video recording with the aim to motivate future EVS volunteers to take part. During one of the lecture we discussed several pieces of advice that we could give to project coordinators dealing with EVS, which are their tasks and responsibilities and in what way they could advertise the Erasmus+ programme. I can say that Opora fits all the criteria we identified. We also talked about the tasks and responsibilities of National Agencies responsible for Erasmus+ in each country. On the third day we drew up the pyramid of our plans for the future and presented them to the other and got some feedback and pieces of advice. The last lecture was dedicated to learning about internet resources on other volunteering opportunities, meetings of volunteers and trainings on working with youth. Besides the lectures, the training gave use the possibility to get to know more about the cultural life of the city. 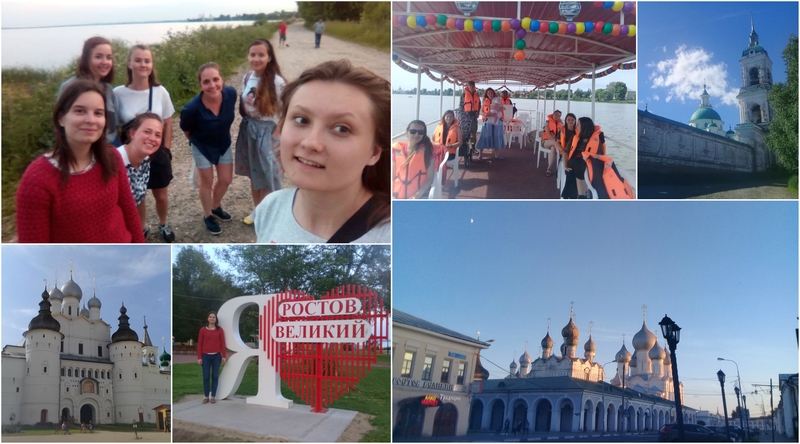 We visited an Orthodox monastery, had a boat tour on the lake and took part in a workshop on traditional painting on wood spoons. Each EVS volunteer staying more that 6 months is entitled to participate in the On-Arrival Training (OAT) at the beginning of the project and the MTM. Those trainings are organised in Russia by SALTO EECA. Lisa and Peppe will take part in this meeting in September.